Leonard Bernstein was one of the most talented and successful musicians in American history. 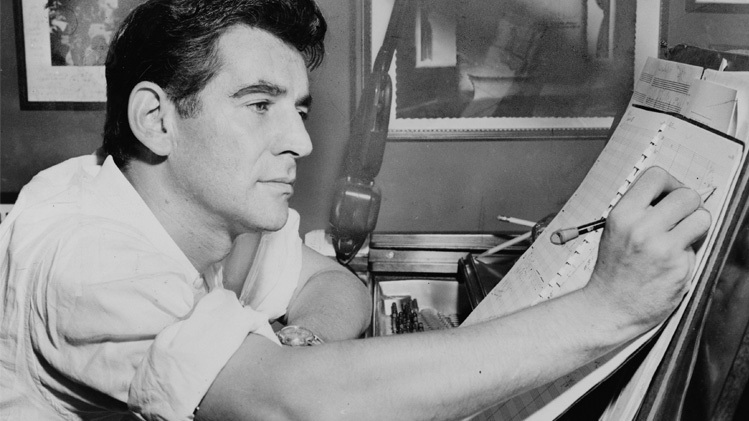 From conducting to teaching to composing, Bernstein’s music—including the scores for his groundbreaking Broadway musicals West Side Story, On the Town, and Candide—continues to be celebrated a century after his birth. This sparkling musical tribute features a roster of incredibly talented Broadway singers, joined by host and director Scott Coulter. Celebrate Bernstein’s 100th birthday by enjoying his greatest hits from West Side Story, On the Town, Candide, Wonderful Town and more! Kelli Rabke got her “big break” playing the role of Dorothy in Paper Mill Playhouse’s acclaimed production of The Wizard of Oz. Shortly thereafter, she was handpicked by Andrew Lloyd Webber to play the lead role of the Narrator in the Broadway revival of Joseph and The Amazing Technicolor Dreamcoat (US Cast Recording). Following that, she played her dream role: Eponine in Les Misérables on Broadway. She went on to perform in regional theaters across the country in such roles as Mabel in Mack and Mabel, Christine in Phantom of the Opera, and back to Paper Mill Playhouse in Stephen Schwartz’s Children of Eden as Yonah (American Premiere Recording). She is one of only two Broadway stars to originate a role in both a Stephen Schwartz and an Andrew Lloyd Webber musical—a distinction for which she is incredibly honored. Kelli was thrilled to return to the NYC stage at the beautiful and historic Town Hall where she has been seen in numerous concerts including Broadway Originals and Broadway Unplugged. Recently, she was the headliner for the Broadway on the Boardwalk concert in Ocean City, New Jersey, performed at Broadway Ballyhoo at the Laurie Beechman Theatre. Her solo cabaret debut, No Place Like Home has its NYC premiere at 54 Below in June. Alex Getlin recently made her Carnegie Hall debut in “Hooray For Hollywood” with Michael Feinstein and Christine Ebersole. She has also appeared Off-Broadway in the company of Anything Can Happen in the Theatre – The Songs of Maury Yeston after being hand-picked by Yeston to interpret his music. A recent graduate of Northwestern University, she made her symphonic debut in June 2017 with the Pasadena Pops under the baton of ‪Michael Feinstein in Broadway: The Golden Age where she starred alongside Liza Minnelli and Joel Grey. She has also performed at Town Hall as a 2016 Broadway Rising Star, and in concert halls around the country celebrating the music of Leonard Bernstein. Northwestern credits include Rose in Gypsy, Mrs. Lovett in Sweeney Todd, The Witch in Into the Woods, and Amy in Company. Alex made her professional singing debut at 17, when she was presented by Feinstein in a solo cabaret show You’re Gonna Hear From Me at the Regency, musically directed by John Oddo and directed by Scott Coulter. Broadway World said the show “marked the emergence of a new and rare talent on the entertainment scene.” Regional Theater: Berkshire Theatre Group, The Music Man. TV: NBC Shades of Blue; Netflix The Break w/Michelle Wolf. Scott Coulter is one of New York’s most honored vocalists. For his work in cabaret, Scott has received five MAC Awards (Manhattan Association of Cabarets & Clubs), five Bistro Awards and two Nightlife Awards for Outstanding Vocalist. He has performed at most of NYC’s top rooms including Birdland, 54 Below, The Oak Room at the Algonquin, and Feinstein’s at The Regency, where he spent a record-setting eight months performing the revue 11 O’CLOCK NUMBERS at 11 O’CLOCK which he also co-created, directed, and musically arranged. His self-titled debut CD won the 2003 MAC Award for Outstanding Recording and was chosen as the best recording of the year by TheatreMania and Cabaret Scenes magazines. Scott was director and star of A Christmas Carol: The Symphonic Concert in its world premiere with the Baltimore Symphony and reprised his performance in the Emmy-nominated PBS production which premiered in December 2013. He was an Emmy nominee himself for his performance in NJPAC’s American Song on PBS. Since 1997, Scott has performed around the country with award-winning songwriting duo Marcy Heisler and Zina Goldrich in their many revues. While singing with Goldrich and Heisler he was discovered by Oscar- and Grammy-winning composer Stephen Schwartz who then invited him to join the revue Stephen Schwartz & Friends.That revue (starring Schwartz and Coulter along with Liz Callaway and Tony Award-winner Debbie Gravitte) has been performing all over the world since 1999. Scott regularly performs in concert both as a solo artist and with a variety of legendary performers including Stephen Schwartz, Tony-winner Ben Vereen, and Grammy-winner Sheena Easton, and has performed with symphonies all over the world including San Francisco, Baltimore, Seattle, Phoenix, Winnipeg, St. Louis, and Calgary. As a director Scott’s credits include many shows for The Town Hall in New York (Broadway by The Year, Broadway’s Rising Stars, Broadway Originals, and Broadway Unplugged) and BBTY for The Berkshire Theatre Festival and Broadway by the Bay. Along with Michael Kerker and ASCAP, he’s produced and directed several installments of Michael Feinstein’s Standard Time at Carnegie Hall. He is creator, arranger, and director of several touring shows (symphonic and non) including Music of the Knights, Cinema Toast, The King: The Music of Elvis, Southern Comfort, That’s Life: A Toast to Sinatra, You’ve Got a Friend: Carole King, Neil Sedaka, and the Music of the Brill Building, Blockbuster Broadway! and his critically acclaimed solo show, The Fella Sings Ella, which honors the life of the legendary Ella Fitzgerald. Scott recently wrote the book for the new musical Got To Be There which celebrates the life and music of songwriter Elliot Willensky. Scott is founder/owner of Spot-On Entertainment (www.Spot-OnEntertainmnet.com) and a resident director of programming at Feinstein’s/54 Below in New York City. He is the artistic director of the Pocono Mountains Music Festival and a proud graduate of the Cincinnati College-Conservatory of Music. Pianist John Boswell has served as musical director for Judy Collins, Andy Williams, Bob Newhart, Scott Coulter, Maude Maggart, Faith Prince, Carmen Cusack, Babbie Green, Jason Graae, and a host of other fine talents. John played the role of Moose in the national tour of Crazy For You and has appeared on The Tonight Show, Today Show, CBS This Morning, Regis And Kathie Lee, and General Hospital, and was the piano playing hands of Nancy McKeon on the sitcom The Facts of Life. Recent concerts with symphonies have included Jerry Herman: The Broadway Legacy Concert, Blockbuster Broadway!, Sheena Easton and Scott Coulter: The Spy Who Loved Me, and Music of the Knights. John has been heard singing in the shows Three Men and a Baby…Grand, Cinema Toast, Broadway Today, Wiseguys, and the New York cult hit Cashino. Broadway/Off Broadway credits include Crazy For You, The Secret Garden, LIZA! Steppin’ Out At Radio City Music Hall, Back To Bacharach And David and The Kathy And Mo Show: Parallel Lives. His monthly concerts in 2017 at The Gardenia in Los Angeles were crowd pleasers. John has eight CDs of original piano music and a ninth on the way. While a student at UCLA, John received the Frank Sinatra Award for popular instrumentalists.